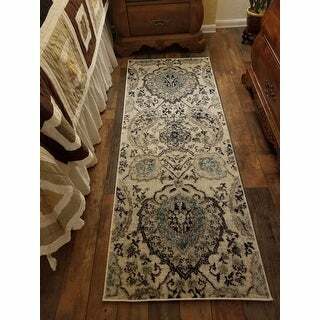 This is a beautiful rug, especially for the price. 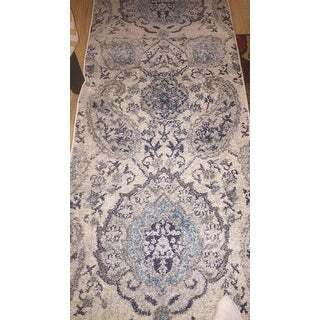 Experience the whimsical beauty and pattern of this bohemian paisley rug from Safavieh's Monaco Collection. Fashionable medallions, florals, and paisley print span the entirety of this playful rug to add a lively look and feel. 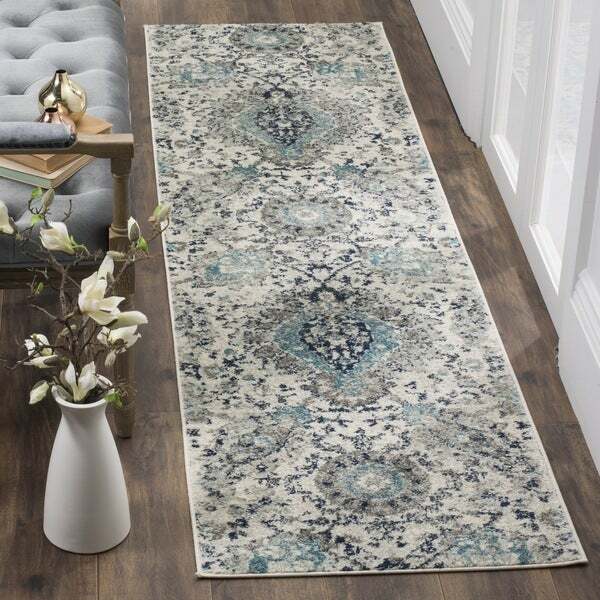 With shades of grey and light blue this rug is a contemporary classic. This rug is so beautiful. The blue & teal is so vibrant. The primary color makes all the other colors pop. 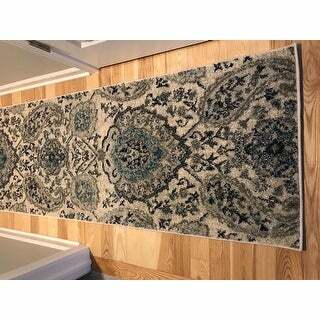 I purchased this runner to match the rug and it compliments my hall. Safavieh is such a great brand. The price is great! Love my new rug. I may have to order the rug tape just to keep it in place. GORGEOUS RUGS! Great quality and nice soft pile. I purchased three of the rugs to go with my farmhouse decor and LOVE THEM! The colors are soft and muted and are as described in the description and as appears in the photo. The colors are gorgeous! I loved t so much that I ordered the matching area rug for my living room! Colors are great. Rug is of fantastic quality. I love a paisley!! I absolutely love this rug. It has a very modern flair which was what I was hoping for. I purchased it for a hallway leading into bedrooms. The rug is exactly as shown. The colors are lovely. I love the little bit of turquoise. The rug took a little longer than I expected. I assumed it was because it was on sale and they had a huge amount to fill their orders. It arrived in just under 3 weeks and I was so happy that it was in great shape. It was packaged well and when I opened it I unrolled it and all was well. It just needed a little weight on two corners for a day. It is now perfect. I do recommend you purchase a non slip rug pad. 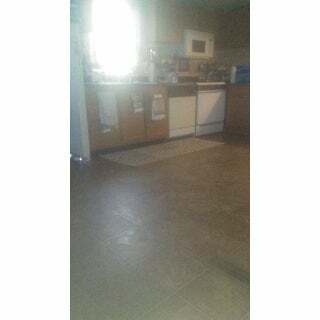 I have hardwood flooring and it does slide without a rug pad. 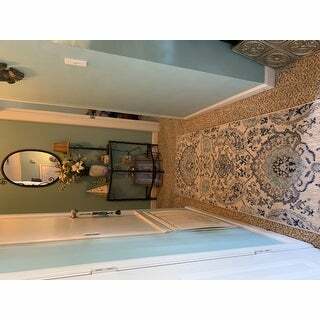 I would highly recommend this rug as it is very nice for the price. I like my new rug its looks really nice in my bedroom. The cream and light grey look great with my wall color. Beautiful rug quality wish I could have used the rug somewhere in my house the rug has more of a turquoise hue than the blue that I had hoped it would have had.Thus is a very nice rug for the price. The rug is well made and beautiful. Color looks exactly like the picture shown on the web. The light blue, dark blue flowers with some grey patterns which matches my decor and SW Agreeable Grey wall perfectly. It was delivered very quickly. I brought 2, the colors were perfect exactly as seen online, I would of hoped they be a little thicker, but for price you can't go wrong. Very happy with them. Love it! beautiful color and I like it is not too thick that I can open the door, l just would like it a little bit longer for where I wanted it. 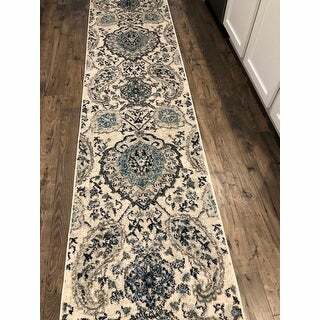 This is a really pretty runner I plan to use in a small hallway in my new house. Really nice neutral colors and almost too pretty to leave on the floor of a somewhat busy area. Great price and great quality. Think it will last for many years. Really glad I bought it!! 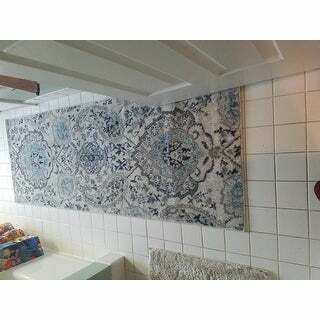 Love this pattern and color coronation and the size is a good fit too it had a good price and similar pattern in various sizes made it the right choice for my needs. 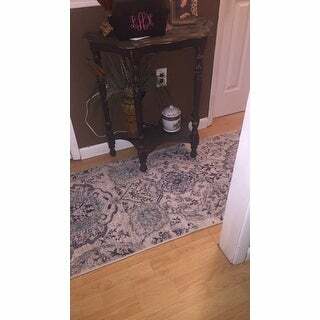 I received this runner quickl, it looks just like the picture, and I love how it looks in my bathroom in front of my vanity! The colors and pattern are beautiful. Just what I wanted! I ordered these rugs in multiple sizes and I must say how much I love them! They are very beautiful and match everything, and my dogs just love laying on them. I highly recommend them. I did have to place some upside down for a day or so to stop the curling, but other than that they are great! The Quality is great and easy on the eyes. This is beautiful. Colors are soft but vibrant. Easy to vacuum and clean. Beautifully adds character to my living space. Nice rug but decided I didn’t like the teal in it. I will be buying a different pattern. I highly recommend this rug, it's super plush, and the colors are very vibrant. I like a mix of styles, this rug didn't disappoint. Great quality. Love it. It's exactly as shown. This is such a pretty runner! The colors are fantastic and it is just what I needed for the hallway. Very nice looking. Can't beat it for the price. "Is aqua one of the colors?" Yes, It is subtle hints of a teal or aqua color. Better in person! "Are the colors consistent between different sized rugs? The runners looked much lighter/faded than the large area rugs. " I bought 4 different sizes and the colors are exactly the same in all. They are pretty... I have had 8 months and they are starting to get a little matted. I am guessing they will last 2 years max, I am pretty picky. "What’s the retun policy on this product ?" "I see the grey and ivory colors but do I also see a light blue/aqua? What is the darker color?" It is a dark navy blue.